When a child dies, the first place that parents, siblings, aunts and uncles often look for comfort is the church. The church – the Body of Christ – will know how to help us. The church will know how badly we hurt – they’ve helped hundreds of families bury their children. The church will be our safe refuge from this blinding storm of grief that has stolen our peace, our sleep, our appetites and our ability to think more than five minutes into the future. The church – where people embody the love of the Man who wept at the death of his dear friend – will weep with us. When our son died, it was difficult to get out of bed, much less to get up, get dressed and go face hundreds of people on a Sunday morning. But we did go, because we follow Jesus, and going to church on Sundays has been vitally important to our family. Act overly happy and bright, in an effort to cheer us up, or to, perhaps, avoid talking about death. Avoid us entirely – turning the other way when they saw us coming, refusing to meet our glances, suddenly becoming busy looking up something in their Bibles as we walked by. When our son died, churches were the place where we heard some of the most painful things, many of them from pastors. We heard this one for the first time two weeks after our son’s death, and then countless times afterward. The death of a child is like falling down and scraping your knee. This is what your experience will be like: blah, blah, blah. At this point I always tuned out…the pain was too intense. To be told what we would feel by a pastor who hadn’t lost a child, rather than asked what we needed or what grief was like for us only made our pain worse. Ryan wouldn’t have wanted you to be sad! This was usually said by those who didn’t know Ryan well, or how he would have completely understood our tears. And it always made me feel like the person speaking was really the one who didn’t want me to be sad…or to be honest. This was typically followed by examples of how the person had lost a parent, grandparent or once, a pet. Nobody knows exactly how someone else feels, no matter how close you are. We would never say this to another family who lost a child, even if that child was 20, gay, struggled with addiction, depression, Hep C and recent hearing loss, and was named Ryan. Every child is unique, and every death is unique. Be glad! He is an angel now, watching over you for the rest of your lives! Aside from the fact that I don’t think this is the way Heaven works, it does what so many trite phrases do: it invalidates our grief. It communicates that we should be happy, not sad. It can make us think that it isn’t okay for us to be honest about how we are overwhelmed by sadness. In the four years since Ryan’s death, I have heard the stories of far too many grieving families who have found not comfort, but only more pain, by attending church after the death of their child. I don’t think it has to be this way. I don’t think it should be this way. Ask them what their grief experience has been like. Allow your parishioners to teach you about grief and loss, and to let you know what they need. Please, please, ask them questions about their grief, and listen without interrupting. How are you feeling about Annelise? What do you miss most about Matt? The power of hearing your child’s name after they have died is enormous. Most grieving parents fear that their child will be forgotten and that their child’s life and death will not matter. Our oldest son had been gone for about seven months when someone at church pulled me aside and gently asked, “How are you feeling about Ryan?” I wept with gratitude and relief. I didn’t realize until later that it was the first time I had heard Ryan’s name at church since his funeral. Just the sound of his name – the acknowledgement of his life, his existence and his value were like a soothing balm to my soul. Let them know that they are welcome no matter how terrible they feel. If we feel we have to force ourselves to act happy just to come to worship, we’re likely not to come. When we are feeling our worst, we need God the most. Please allow us to find Him in community with others, even when we are miserable. Even when we’re not sure if life is worth living. Tell them that there is no timeline for “getting over” a child. Parents who have lost a child – if as a newborn or a middle-aged adult – desperately need to know that there is no expectation to “get better” in six months, one year, five years or ever. Reassure them, if needed, that God can handle all their questions, doubts and anger. Although my husband has only felt closer to God since Ryan’s death, after about six months, I began to struggle with a lot of questions that affected my faith deeply. I didn’t need answers – only permission to wrestle through my doubts and fears with God. Remember, too, that asking questions, doubting and not attending church don’t mean we are walking away from God – quite the opposite. Please trust Him to meet us in our pain. He has, and He will. Listen…without having to provide solutions. And then listen some more. Unless you are Jesus Himself, you will not be likely to be able to bring their child back. And that is the only thing that would alleviate their intense sorrow. So don’t even try to fix anything. You can’t. Know that grief – and tears – demand to be felt and experienced. The research all points to the same thing: if one doesn’t acknowledge and make room for their grief, their grief will find another way to express itself. Alcoholism, health problems, rage issues, marital problems, mental health concerns and a myriad of other stress-related problems can all be the result of “stuffing” grief inside in order to make others feel more comfortable. Teach your congregation to keep reaching out to the bereaved, even if they don’t know what to say. Know that birthdays and anniversaries of a child’s death are particularly painful, but immensely important. A simple way to let a grieving family know that you haven’t forgotten them – or their child – is to make a note of their child’s birthday and the anniversary of their death on your calendar, so you’ll be reminded to send them a card, leave them a voice message or shoot them a text. On Ryan’s would-have-been-24 birthday, our pastoral staff sent him a birthday card, complete with personal notes to him telling him how his life has impacted them. It was one of the most comforting, honoring things anyone has ever done for us since Ryan’s death. Remember that by bringing up their dead child, you won’t remind them of anything they aren’t already thinking about. Some well-meaning friends avoid talking about the child, because they don’t want to make the grieving family cry. But truly, we can hardly think of anything else – especially in the first months and years. It is only comforting to know that other people remember, too. And our tears aren’t bad…they are necessary. They are healing. Get to know him or her by asking about favorite memories, what they were like, etc. This is especially important if the child committed suicide or died as a result of addiction. Grieving parents of kids who struggled feel especially alone, and often sense judgment and condemnation of themselves and their child. Please acknowledge to beauty of every child’s soul, not just those who were successful in the world’s eyes. I’d like to sit out in the very quiet courtyard at St. Andrew Presbyterian, with a bowl of cherries, and a bowl of M&M’s as communion elements, and talk to people one at a time. This says it all: just giving permission for people to show up, knowing that someone will just be with them, allowing them to feel exactly how they are feeling. Sitting with a friend in their sorrow is the greatest gift we can give to someone in pain. Allow us to be sad as long as we need to. It is in that sadness that God meets us, and that He, slowly, redeems and restores our souls. We will never “get over” our dead child, nor do we want to. But if we can be patient with ourselves and with God as we heal though the pain, He will help us not to get better, but to be better. This entry was posted in Learning to Grieve with Those Who Grieve and tagged bereaved parents, Christianity, grief, Grief and loss, grieving well, parents who lose children on August 6, 2013 by Linda Robertson. This was beautifully stated, we never know what to say to those who are grieving. It is an impossible position, sometimes our presence and our silence are the only gifts we have. I learned this many years ago when my best friend committed suicide. Our priest was a prat who wouldn’t of course allow his funeral in the church or for him to be buried in consecrated ground. It was an additional and terrible blow to his mother whose grief was already too much. So I learned, to just sit with her as we planned a different memorial. I learned to listen, to hold her hand, to look at pictures, to listen more, to answer the phone when she called and listen more. I didn’t know the trite words or phrases then, he and I were both so young back then. But the lesson I learned stayed with me. Valentine – What a GIFT it was that you were there for your friend’s mom! I am so very, very sorry you lost your best friend…I can’t begin to imagine how painful that must have been. Much love to you! I suspect at the time, she and I were both very fortunate. Mostly because I was so young and dumb, I simply didn’t know what to say so I didn’t say anything at all. It was a terrible time, horrifying really. Linda, so. so. beautiful. Your writings are helping countless others, least of all…me. I am learning much from you. This post makes me wish that I had known Ryan in life and yet through your writings, I’m getting to know him. I want to be the friend to others that shows up and loves unconditionally and listens! Love to you and to Rob! My heart hurts for your family. I am guilty of wanting to make things better for people I love, and that doesn’t come across effectively, at times like this. I want to be more like you and Ann Lamott. Love and hugs, sweet friend! Love you, Rob and Linda! Thank you for continuing to love Ryan so beautifully and for sharing him (and yourselves) with us so generously. Amen, sister! After our son died, I came to realize that the church – not only the congregants, but the pastors and those who think of themselves as spiritual counselors, too – is sorely lacking in training on how to comfort those who mourn. I think there is a general feeling that God will meet all needs, including the deep grief over the death of a child; that, if we are deeply grieving or grieving for longer than deemed necessary, we are not allowing God to heal us; that, if they just wait, we will “get better”; that, because “the joy of the Lord” is supposed to be our strength, we don’t need to mourn extensively over the death of our child; that our grieving should not take too long because we have faith. The death of a child is one of the most traumatic, unthinkable losses. We just need people to walk with us and care. Rebecca…thank you for your kind, and wise, words. It sounds like you speak from experience. 😦 If so, my heart aches with you. Yes…it’s been quite a walk, to say the least. Sweet Linda and Rob, thank you for sharing this. So heartfelt and convicting. I was inspired to blog today based on what you said here. Thank you for your open hearts. Thank you for posting this. A very close family friend took his life a few years ago and while our family wants to be supportive of his family and friends in their grief, and supportive of each other in our own mourning, sometimes we aren’t sure how to be who and what they need or want. Your words will help us understand how we can best be there for his parents and siblings; some of what you have said confirms what we’ve already learned, and some of what you have said will help us along the way. As always, I am sorry for your loss. 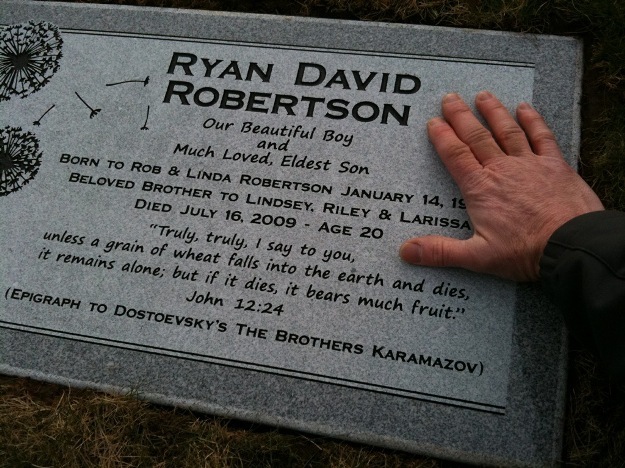 Your son Ryan sounds like a wonderful man who left this world too soon. I hope you know how much sharing his stories and your own stories have helped, and will continue to help, people all over the world who are struggling. I lost a lot this year in the way of family, income and things, etc… It’s been one of the hardest years ever. And I’ve never felt more free and at peace with God. I think society is turning around, albeit slowly. I hope you find the soup you are looking for. Thank you for this. You hit on something that I think needs to be said more often and louder. It’s amazing how poorly the church equips us to deal with loss and grief. So many of the soundbites are insulting to those who are dealing with all the emotions that the death of a loved one brings on. Sometimes I think we need to listen to how we sound to people outside of the church. WOW! I think I need to figure out how to watch that show! SO good! EXACTLY, Bobbie…you said it perfectly. It doesn’t matter how long it has been…we never “get over” losing our children. Thanks Linda~for being real and sharing Ryan with all of us. About 10 weeks into my 4th pregnancy I began spotting. I had never experienced anything like that before and was fearful. When we saw the doctor at the hospital for an ultrasound (not our loving, caring midwives), he coldly and callously told me that there was evidence of a pregnancy but he was unable to detect a heartbeat. Then he turned around and walked out of the room, leaving me on the table in tears. The nurse who was in the room with us quickly tried to comfort me, told me that sometimes the baby is too small to detect and encouraged me to have blood work done as they would be able to check my hormone levels. We had blood drawn and as I laid in bed later that night I told God that if this child wasn’t going to live that He better take it from me now. That if He allowed me to go through an entire pregnancy and then rip that child from my arms, I would hate Him forever and never trust Him again. Why did I tell Him those things? Well He knew I was thinking them and I figured His shoulders were big enough to take my anger. I think it was within the next day or so that I knew I had physically passed the baby and my next blood work showed that all my hormones had significantly dropped, indicating a miscarriage. It was a very sad time for me and even though I already had 3 beautiful children, I wanted this one too….dammit!! I can’t even begin to imagine losing a child that you were able to hold, kiss, watch grow up and create wonderful memories~what you have shared today is so helpful for me to know how I can be of help to someone who’s experienced great loss. Lots of love and prayers to you, your dear husband and your children!! Debra, thank you for sharing your story…Miscarriage is a HUGE loss, and often not treated with the sober respect that it should be. No wonder you wanted that baby!! XOXOXOX to you!! We so often forget that they had it right. “Then they sat on the ground with him for seven days and seven nights. No one said a word to him, because they saw how great his suffering was.” They just sat with him and mourned with him. Yeah they blew it after those first seven days…but heck, we often don’t even give folks seven days to mourn…let alone seven months or seven years or however long it takes. Thank you so much for reminding us to allow people time to mourn and suffer. It is in suffering when we can most identify with Christ…it doesn’t seem like it at the time, that’s for sure. but it is more true than anything else in this world. Thank you for being so much like Christ in who you are and all you do and say. Wow, Trista!! I LOVE that! I have never viewed the story of Job that way – but you are SO right! They INTENTIONALLY chose to enter in to Job’s pain, to comfort him by crying with him and truly sharing his pain. I think that passage just became my favorite “grief” scripture! Thank you for sharing!! Linda I cried reading your blog! My brother died almost 2 years ago and I only wish I could have shown my friends at school and Church this advise. Attitudes here in Britain to death are awful, and as my brother was disabled, talking about him became seems to be a even more of a taboo. The point about the birthdays, Christmases and other occasions is particularly spot on. Sam died just before Christmas and every Christmas since has been upsetting since. The worst example: the day Sam died I was due to go to a party, but obviously I didnt go. That person had a party the next year (Dec 2012), two days before the anniversary, (both parties were on a Friday) and I ended up being in floods of tears. Before I start ranting about the various times I’ve been emotional. I’ll sum up by agreeing with yourself and the other people who’ve commented. It was so weird being in a tight Catholic community, that did not seem to give a huge amount of attention to the fact that a child in the community had died. Had Sam been able to walk and talk, there would have been so much more shared grief, and I pray that many more people can read and learn from your blog about this painful time. Rory…I have chills…and tears. What an incredible brother you are…sibling grief is HUGE and overwhelming. What do you miss most about Sam?? A lot of things – his smile that we only saw that often when he was young before the epilepsy. All griefs are upsetting and I’m just happy I got to read such a powerful blog like yours! Big hugs to you, Rory! Amazing Linda! Thank you for this post. I had a relative of mine that past away a few months ago. She was my cousin’s grandmother, and she was a lovely, strong woman that everyone in my family loved and respected. Personally, I was not close to her, but I respected her so much because she has helped my family from time to time. We do miss her. This post is valuable to me because I can now properly interact with my cousin and just be there for her in dealing with this loss. At the moment, the family is alright on the outside, but I know that tragedies like this do not heal that easily. Thank you so much. P.S. : After reading the section on how a pastor compared death to a scarped knee, I was furious! I felt your pain. How dare he say that. The only thing different I would have done differently in that situation was rushed up to the pulpit, cursed him out, and pulverized the wrath of God in him. Let him dare say that again. Sorry, but I had to share that with you. Lol. Have a blessed day to both you and your family. God bless. Favian…thank you for making me laugh this morning! You are wonderful! I will pray right now for your cousin…and for you as you grieve with her. Much love! As a gay man who worked for and with people with AIDS, many close friends, and attended far too many funerals your advice is spot on. I have seen grieving parents and sadder yet attended a funeral of a transgender woman who had no family and was buried in a plot reserved for the indigent. Loss is always different for each person and it is uniquely painful for parents. Thanks for sharing this, it also helped me. You are so wise…but you have paid far too high a price for your wisdom. Would love to hear more of it. Thank you for this wisdom. Praying for you and your family tomorrow as you remember Ryan’s birthday. I am crying on the inside as I read this post. I feel so angry at the way the church has acted like Job’s pathetic “friends” in response to your grief and pain. So glad someone finally said Ryan’s name. I can relate to that from my own grief in the past; I don’t want to forget my loved one. If we can’t come as we are to worship God in the church, the church must be getting it wrong. Jesus said, “Come unto me all you who are weary and heavy laden and I will give you rest (Matthew 11:28)”. It was comforting to read of God handling your questions, doubts and anger – I have a friend who lost her dad suddenly and she seems to be going through that phase. I am going to reblog this because it really struck a chord with me and I’m sure it will touch the people who read my blog. Bless you, Merryn…I pray that our experience can encourage others as you have encouraged me! A touching post which says it like it is. When I lost my son many years ago, I went through much of the same things at church. You have said this very well my friend. Thank you for sharing this and may God continue to comfort you as he does me. Blessings! I read this through Merryn’s reblog and it offers such amazing insight and information. People so often don’t know what to say, or how to act around the grieving.